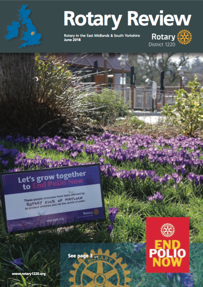 Rotary Review is published twice a year, on the occasion of the District Council Meetings (usually December and June). The deadline for contributions is about four weeks before publication but a later date can sometimes be accepted subject to discussion. Articles and reports are welcomed from District Officers, Clubs and Rotarians and friends and the editor will endeavour to publish all suitable items, subject to space being available. Currently, we print 20 A4 pages in full colour per edition. The current format makes extensive use of photographs and reduced quantities of text; the reports accompanying photographs need to be succinct and to the point. We still welcome more extended, topical features which will usually run to a full or half page. A page is composed typically of 600 words with 2 pics, 500 with 3 pics and 400 with 4 pics. Club contributions should be no more than 100 words in length with a photograph of reasonable quality (300+ kb) to accompany the article. Where there are a number of photographs covering an event, the contributor should select the one to be used and send only that one. Clubs can submit several items for consideration but it is likely that only one will be used per edition. We are looking for unusual, newsworthy club activities, particularly examples of Rotary Service in the community and working for overseas projects. It is interesting to see how clubs develop their Rotary Fellowship; photographs of Rotarians handing over cheques are NOT really what we want. Preferably, an article should be submitted as a Word file and contain the caption to the photograph if one is included and be emailed as an attachment. The photograph should be sent as a separate jpeg file. There is some space to publish commercial adverts. Please contact the Editor for current rates. 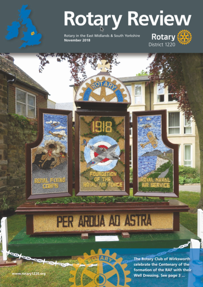 All contributions should be sent to the District Editor, John Scotney (Rotary Club of Belper and Duffield). 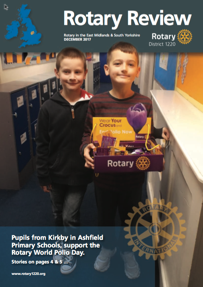 Details of how to contact the Editor are in the current District Directory, or via APAC by clicking on the image of John.